The power of a simple stretch. Most of us sit in flexion all day hunched over a computer screen, slouched in our car or on the couch. When you sit at a computer for extended periods of time the pectoral muscles get tight and pull your head forward. Head forward postures can be the cause of headaches, disc injuries, and dysfunctions. Here are 3 simple stretches you can do to counteract the sitting pose. Include these in your workouts, warm ups or even throughout the day at work. As with any new exercise regime consult your doctor prior to trying these exercises. Press into the hands and feel the stretch through the chest and into the shoulder blades. Use the breath to stretch. Avoid arching your back when moving through the doorway. Slide your bum to the back of your chair. Slowly lean back over the chair so that you are looking at the ceiling. Repeat this exercise 10 times, don’t hold it. You should push only to the point of tension. You should not experience any pain, remember, never force the movement. If you are stiff in this direction it may take many weeks of repeating this exercise to regain full range of motion. Lean your back against a wall with your feet a few inches from it. Bend your knees slightly and press your back into the wall. At no point through the movement should you allow your low back to arch. 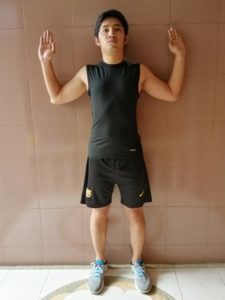 Press your upper back into the wall and relax your head as you bend your arms and place the back of your hands against the wall right outside your head. Keeping your back firmly against the wall and your core tight, slide the back of your hands up the wall as far as possible. Then slowly slide them back down. The extension must be felt in your upper back not your lower back. 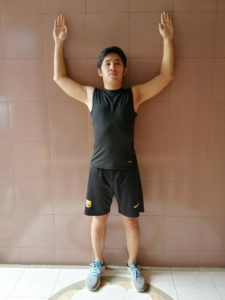 Repeat, reaching up the wall and each time try to get higher up the wall. In addition to incorporating these stretches, find ways to break up the time you spend sitting at work. Use a standing desk if one is available to you, go for a walk during lunch, and take short breaks throughout the day to stand up and stretch things out.